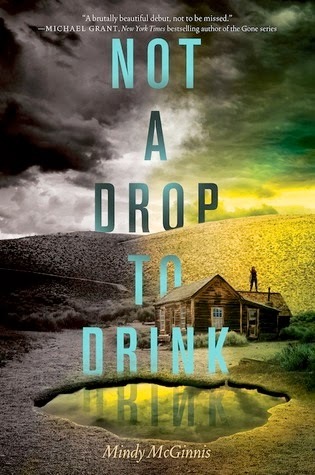 So the world is dry… And it perfectly encapsulates how to describe Not a Drop to Drink. I’m not saying that I didn’t enjoy the book, because I did. I even read it in less than 24 hours (That could be because it was the first book I have been able to read in more than a month that wasn’t school-related.) and I plan on reading the sequel. However, the book wasn’t a knock-me-off-the-edge-of-my-seat kind of read. The ladies over at HarperTeen’s Tea Time had me expecting so much more. The book starts out introducing a character who isn’t really relatable in any way. She reminds me of Katniss a little in that she doesn’t seem to have any strong emotions during the first part of the book, but then you grow to see her softer side. But I thought that the softer side came about a little too easily. Lynn, the female protagonist, has been raised to shoot first and ask questions later, so why did sixteen years of training suddenly fly out the window? I couldn’t really understand how she changed so much in such a small time period when she’d been engrained to act and to act fast. The secondary characters were less confusing, but still not completely relatable. I couldn’t understand why Stebb, Lynn’s neighbor, stayed out of Lynn and her mother’s lives’ so much. McGinnis gave an explanation, but I just couldn’t find it believable considering people could use as much help as they could get in this world. Now Lucy, the young girl with the family that’s almost encroaching on Lynn’s territory, is cute. I like how she brings out the goodness in Lynn, I just didn’t like how similar their names were—both start with L’s and both are four letters long. I had trouble distinguishing the names at times. Additionally, the love interest, Eli, is supposed to be interesting, but while I liked him, I didn’t love him. He wasn’t even in the book enough for me to really even get to know him. The world building is good, and I enjoyed the background, but there was one thing I couldn’t understand. Why would people move farther south for water? Wouldn’t the water have dried up there more than it would if you go farther north? I know it’s cold in the north, but I still don’t get why you would move somewhere where water evaporates even more. And I guess that’s another thing that I find odd—there was no explanation for why the water was gone. I found the ending to be completely unsatisfactory. And that’s all I can really say about that without some major spoilage. All in all, this book is a quick and entertaining read. It’s just, when you actually start thinking about why these characters are doing what they’re doing, and why the world is the way it is, you realize that some things don’t quite add up. I’d recommend this book for anyone who just wants a light (not in a cute and fluffy contemporary way, it still has blood and guts in it) dystopian read. *Note: I purchased this book for myself.